As written in my previous post, I have just finished installing a Server 2008 R2 to conduct a proof of concept. I have also some PDF documents that I will use for reference. So I was just about to install some PDF reader software, but then I thought, hey why “install” software, there must be something small out there that allows me reading a PDF file without having to install anything on my fresh installed server. 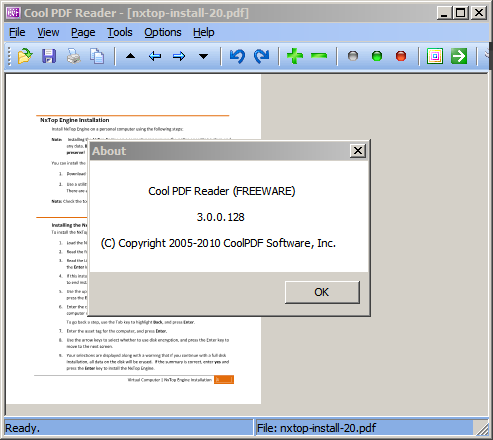 I’ve come across various portable applications, but at the end I found a really cool one called Cool PDF Reader, well neat would actually be the better word, as the executable only uses 651KB and does not require an install. Cool PDF Reader is FREE and can be downloaded from here.